Keswick is a busy town in the Northern Lake District. In the 16th century the discovery of graphite in the area established the town as an important centre for manufacturing pencils. Today its economy is almost entirely devoted to tourism. Keswick is within easy reach of England’s highest mountains; Scafell Pike (3,209 feet), Sca Fell (3,162 feet), Helvellyn (3,117 feet), and Skiddaw (3,054 feet). Derwent Water lies just south of town and is the third biggest lake in the Lake District. Bassenthwaite Lake, just three miles north, occupies fourth position. Buttermere, Crummock Water, and Loweswater lie closely together to the west in the Vale of Lorton. Thirlmere, to the east, is a reservoir created to supply Manchester with water. Many consider Derwent Water one of the prettiest lakes in the Lake District. The easiest way to experience the spectacular scenery is to take a 50-minute cruise around the lake with Keswick Launch. The main landing stage is at the bottom of Lake Road in Keswick but the boats calls at six more stops where passengers are free to hop off and on and explore the area. Popular walks in the area include circuits around Derwent Water and Buttermere. Both have paths around them that pretty much follow the shorelines. The circuit around Derwent Water is around nine miles while the route around Buttermere is approximately four miles. Walkers reaching the summit of Catbells are rewarded with a magnificent view of Derwent Water. Many start the trip from Hawes End, one of the stops served by the Keswick Launch. Latrigg is one of the lowest fells in the Lake District but offers great panoramas of Derwent Water and Bassenthwaite Lake. It is easily reached from Keswick but the car park at the end of Gale Road offers even quicker access. Skiddaw can also be climbed from here. Visitors wishing to get onto the water themselves can hire motor boats, canoes, and kayaks from various operators around the lake. Options include the Keswick Launch, Derwent Water Marina, Platty Plus, and Nichol End Marine. The Theatre by the Lake enjoys a beautiful setting close to Derwent Water. The repertory theatre produces up to nine plays a year, and also hosts concerts, films, and many of Keswick’s major festivals and events. Visitors can watch the latest movies at the town’s Alhambra Cinema. The Keswick Museum is a traditional Victorian museum with an eclectic collection of exhibits. Amongst the odd collection of curios on display is a 600 year old cat, a giant xylophone made with slate from Skiddaw, a penny farthing bicycle, and the writing desk of the Poet Laureate Robert Southey. It’s situated in Fitz Park, a grassy municipal park at the northern end of the town with a fantastic children’s playground, tennis courts, bowling green, putting green, and riverside walks. Hope Park is the other major park in Keswick. Situated on the way to Derwent Water it features ornamental gardens, plenty of seating, a pitch and putt golf course, putting course, and crazy obstacle golf course. After the discovery of graphite in the Borrowdale in the 16th century, Keswick became an important centre for pencil manufacturing. The Pencil Museum tells the story of how pencils are made and is also home to the world’s longest coloured pencil. It also offers a children’s art studio, demonstrations and drawing workshops. Castlerigg Stone Circle is the most visited stone circle in Cumbria one of the earliest and most impressive in Britain. It stands on a remote plateau, with a fantastic 360 degree view of the surrounding fells. Bassenthwaite Lake is the only actual lake in the Lake District; the others are meres or waters. In 2001 the first wild ospreys to breed in the Lake District for more than 150 years set up home here and have returned every year since. There are two official viewpoints, both in Dodd Wood, and the birds normally arrive in March or April and leave in August or September. Mirehouse is a historic country house close to Dodd Wood that boasts impressive literary and artistic connections. It features an interesting collection of furniture and art, extensive gardens, nature trails, and woodland adventure playgrounds. Whinlatter Forest Park, between Bassenthwaite Lake and Derwent Water Whinlatter is England’s only true mountain forest. It offers two mountain bike trails, and children’s adventure trail, numerous walks, and a café and visitor centre. The Go Ape tree top adventure course is also here and features Tarzan swings, zip wires, rope bridges, and more. Trotters World of Animals, at the head of Bassenthwaite Lake, is a zoo with over 100 species. Handling of the animals is actively encouraged and there are also feeding programmes, birds of prey displays, a children’s play area, and a café. Annual events include the Keswick Film Festival (February), Keswick Half Marathon (May), Keswick Jazz Festival (May), Keswick Mountain Festival (May), Keswick Beer Festival (June), and the Keswick Agricultural Show (August). Further details about all these attractions and events can be obtained from the Keswick Tourist Information Centre. It’s situated in the Moot Hall on the Market Square. It also offers an accommodation booking service, maps and walking guides, gifts, souvenirs, and more. Keswick is a popular tourist destination and boasts an extensive selection of hotels and places to stay. The Queens Hotel enjoys a great location on Main Street in Keswick town centre, right next to the Moot Hall. The historic property dates back to the first half of the 19th century and offers 35 en-suite guest rooms. Hotels with extensive leisure facilities include Armathwaite Hall, at the head of Bassenthwaite Lake, and the Lodore Falls, at the southern end of Derwent Water. Castlerigg Hall is just across the road and enjoys fabulous views of Derwent Water. It accepts touring caravans, motorhomes, and tents but also rents out holiday caravans and camping pods. The site boasts extensive facilities including a large playing field, laundry, showers, a kitchen for campers, and a restaurant serving traditional Cumbrian breakfasts and evening meals. A well-stocked shop offers meat, fresh vegetables and bread, milk, beer and wine, toiletries, and newspapers. Other camping and caravan sites around Keswick include Herdwick Croft near Bassenthwaite Lake, and Burns Farm in St John’s in the Vale. 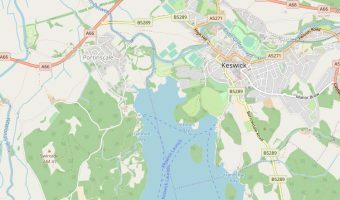 Keswick is easily reached from the M6. Simply leave the motorway at Junction 40 (Penrith) and take the A66 west for 16 miles. Allerdale Borough Council operates several pay-and-display car parks in Keswick town centre. The Otley Road Car Park (CA12 5LE) offers 87 spaces while the Bell Close Car Park (CA12 5LS) offers 121 spaces. The biggest car park in Keswick, with space for 334 vehicles, is the Central Car Park (CA12 5DF) on Central Car Park Road. Another large car park is the Lakeside Car Park on Lake Road (CA12 5DJ). It offers 253 parking spaces and is convenient for visitors to the Theatre by the Lake and Keswick Launch. Bus service 73/73A (The Caldbeck Rambler) from Keswick calls at Castlerigg Stone Circle, Mungrisdale, Mosedale, Hesket Newmarket, Caldbeck, Ireby, Uldale, the Castle Inn, Bassenthwaite village, Mirehouse, and Applethwaite (Skiddaw). It runs every Saturday throughout the year and every day in the summer months. Bus service 77/77A (The Honister Rambler) from Keswick stops at Portinscale, Catbells, Grange Bridge, Seatoller, Honister Slate Mine, Buttermere, Lorton, and Whinlatter. The service operates every day throughout the summer. Service 78 (The Borrowdale Rambler) from Keswick to Seatoller calls at the Lodore Hotel, Grange Bridge, and Rosthwaite. The 555/556 bus service from Kendal to Keswick stops at Staveley, Windermere train station, the Lake District Visitor Centre at Brockhole, Ambleside, Rydal, Grasmere, and Dale Bottom. The X50 bus service from Keswick to Penrith, calls at Threlkeld, Troutbeck, Penruddock, Stainton, Rheged, and Penrith train station. The X4 from Workington to Keswick, stops at Great Clifton, Cockermouth, Embleton, Brathay Hill, the Castle Inn Hotel, and Bassenthwaite, while the X5 from Workington to Keswick stops at Great Clifton, Cockermouth, Embleton, Brathay Hill, Thornthwaite, and Braithwaite. On Saturdays in the summer the X8 bus service from Chorley in Lancashire to Keswick, stops at Preston, Windermere train station, Ambleside, and Grasmere. National Express runs a daily coach service (570) between Whitehaven and London. Stops on the route include Workington, Cockermouth, Keswick, Grasmere, Ambleside, Windermere, Kendal, Carnforth, Morecambe, Lancaster, Preston, Wigan, and Birmingham. Keswick train station closed in 1972. The nearest railway stations are Penrith (16 miles by road) and Windermere (20 miles).